Indian Air Force inviting applications for Airman Group X Trade, Airman Group X Trade. Selection test for Airmen Recruitment for unmarried male citizens of India and Nepal for Intake/Entry 01/2020. 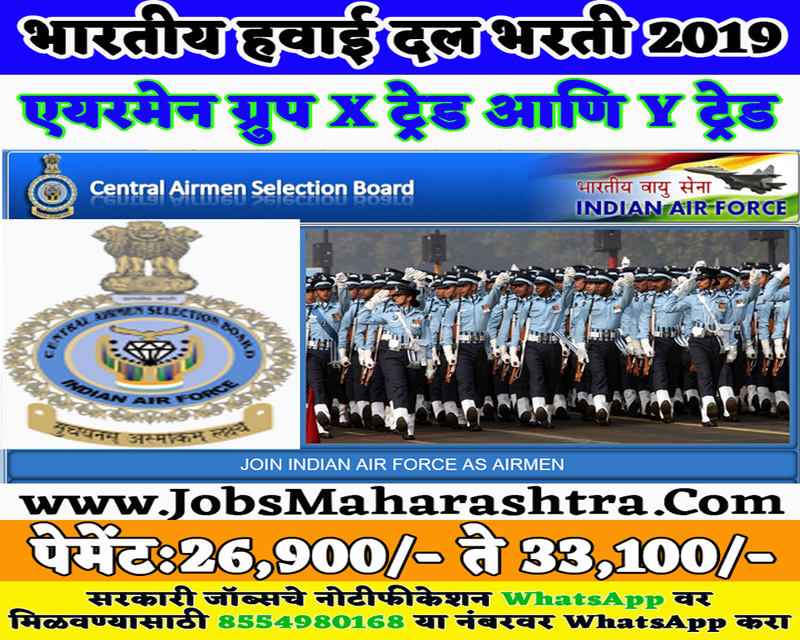 Interested and Eligible candidates who wants to apply for these posts submit their applications on official website of Indian Air Force before 21 January 2019. For more details like age limit, salary, how to apply, selection process please refer the below article. 1. Candidate born between 19 January 1999 & 01 January 2003 (both days inclusive) are eligible to apply. 2. In case, a candidate clears all the stages of the selection procedure, then the upper age limit as on date of enrollment is 21 years. Rs. 26,900/- to 33,100/- pm payable as a salary. Minimum acceptable height is 152.5 cms. Minimum range of expansion: 5 cm. 1. Post No.1: Passed Intermediate/ 10+2/ Equivalent examination with Mathematics, Physics, and English with minimum 50% marks in aggregate and 50% marks in English. OR Passed Three years Diploma Course in Engineering in any stream. 2. Post No.2: Passed Intermediate/ 10+2/ Equivalent Examination in any stream/ subjects approved by Central / State Education Boards with minimum 50% marks in aggregate and 50% marks in English. 3. Post No.3: Passed 10+2/ Intermediate/ equivalent exam with Physics, Chemistry, Biology, and English with a minimum of 50% marks in aggregate and 50% marks in English. Online registration for the selection test shall be available from 02 January 2019 on below given official website and shall close on 21 January 2019. Detailed instructions on how to register/fill-up application forms are available on the website. Candidates are to strictly follow the given instructions. 1. Online test (for both group 'X' Trades (except Education Instructor Trade) & Group 'Y'. (Except Automobile Technician, GTI, IAF(P), IAF(S) and Musician Trades. Eligible candidates will be sent Provisional Admit Cards for Phase- I of testing on their respective e-mail ID's during the month of March 2019. 2. Group 'X' Trades (Except Education Instructor):- Duration of the online test shall be 60 Minutes and shall comprise of English, Physics and Mathematics as per 10+2 CBSE syllabus. 4. Both Group 'X&Y' Trades:- Duration of the online test shall be 85 minutes and shall comprise of English, Physics and Mathematics as per 10+2 CBSE syllabus and Reasoning & General Awareness (RAGA).